With active learning environments on the rise, new AV systems support classroom collaboration. 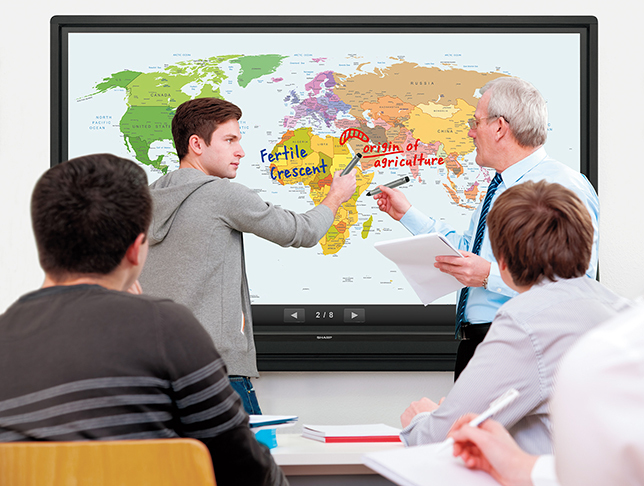 Sharp's Aquos Board allows students and instructors to collaborate and share content. Here are Tomei's four key recommendations for planning successful AV projects. Think ahead. Make sure the systems you design will support your future needs. For instance, while 4K video displays might be too cost-prohibitive for some schools to install today, "I do specify video switching that can handle 4K," Tomei said, "so when you're ready to upgrade, you can." Focus on design. Spend most of your time on doing a needs analysis, and talk with instructors about how they want to teach. "AV shouldn't hinder teaching and learning; it should facilitate these," he advised. Include enterprise management. Your tech staff should be able to remotely monitor and troubleshoot AV equipment. "AV staffing doesn't increase proportionally with the amount of classroom technology," Tomei noted, "so remote access and support is critical." Don't overlook staff support. Schools need to offer academic tech support as well. "You have to teach instructors how to use these systems, because they will require new pedagogies," he said.